After many years of producing and engineering for various types of media projects, utilizing single drives for the various assets, then backing up to optical disks, I decided it was time to move into the world of Raid drive redundancy. I have, at various times, used Raid 0 setups, but that speed has a trade off…protection. After much research between various vendors, manufacturers, and creative pros alike, I decided I would enter the world of small drive arrays by purchasing a 4 disk 4 Terabyte Raid 5 array. Utilizing eSATA, this would allow me to edit from the array while having drive redundancy. Should I encounter a drive failure during editing or while making backups of projects, I would just need to replace the failed drive with a new drive and the array would rebuild itself automatically. In a high-end system, in theory, one could actually continue to work while the rebuild was taking place. 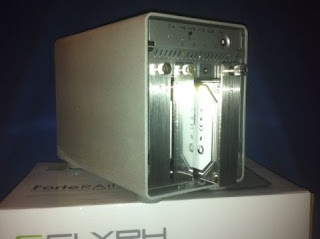 In my case however, for the work loads that I normally deal with, I do not need to start out with a high-end array so I chose to go with the Glyph ForteRaid 4TB unit, for various reasons as described in this article. It was upon setting mine up, that there were a few instances that weren’t really clear enough for setting up the Raid array correctly to operate on a Windows PC such as mine. So, I decided to write this article to help others in configuring their own. Though there are a few documents related to configuring the Glyph ForteRaid hard drive array, it is hard to come by the correct way to configure it for using a Raid 5 setup for a Windows 7 system while utilizing an eSATA connection. This guide is on how to prepare the ForteRaid drive array to run on your Windows 7 PC in Raid 5 mode. There are no warranties, guarantees, or implies of any type here that these steps will work in your particular setup. This is only a guide and it is not endorsed or used by any manufacturer, dealer, or distributor. Use at your own risk or peril of loss of data. Again, this is for configuration as a Raid 5 setup only. As always, remember to backup your data to another location before attempting formatting of a hard drive, as the data WILL be deleted. 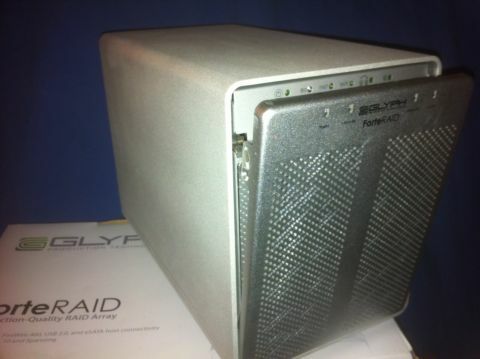 I chose the Glyph ForteRaid 4 Terabyte drive array solution as it met my needs, my budgetary constraints, my Raid desires, and offered the best overall warranty, while Glyph’s reputation still preceeds itself. Many other manufacturers were considered, such as OWC Mercury Elite Pro (which is pretty much the same unit as the Glyph), the G-Technology Speed Q, and the Sonnet Fusion. Realistically, they all offer similar performance, raid options, and standard warranties, however, Glyph offers an additional 2-year basic data recovery, and 1 year advanced replacement warranty above and beyond the standard 3 year warranty for the hardware itself and 3 years on the drives. As a side note regarding G-Technology, I had the opportunity to setup a 4TB unit for a company that uses a Mac Laptop. Setup was fairly straight forward, but there was no real confirmation that the drive was setup correctly. It does display a popup window at the end of configuring the Raid setup as per the instructions, but it does not read simply ‘setup complete’. Also, the available Raid choices were only 0 or 5 and there was no monitoring function at the time. Hopefully these items will be modified to help the user in the near future. I was glad to have gone through this process as well, which gave me the chance to know how their system gets configured and runs, as well as it was in my top 3 choices of array’s to purchase. From here, the next level of Raid enclosure gets into miniSAS based units. These units, while they do run faster, become more expensive rather quickly, as you need to purchase a separate miniSAS host adapter card additionally if the array does not come with one already. These do however, become necessary when working with larger 10-bit HD video. There are also some enclosure manufacturer’s such as SansDigital and Stardom that offer similar array setups, minus the drives that go in them. Many offer a 3-year warranty as well. Other manufacturer’s that were considered at some point along the line were CalDigit and Maxx Digital. They both have an excellent reputation but tended to be out of my price range. Other vendor/manufacturers to consider, based on your budget are Dulce, iStoragePro, RocStor, DataVideo, ProAVIO, Drobo, and Studio Network Solutions. There are others, but you need to do you homework and assess what your workflow requires. Some day I hope to move up into this next category of enclosure Raid system. Now, regarding hardware vs software raid controllers in these types of arrays. During my time researching, I found a few different things regarding this particular array. First of all, it uses the Oxford 936 chipset in its box. I discovered that there are 3 versions of this chipset. The 936DS, 936SE, and the 936QSE chipset. The 936DS is used for dual storage arrays for creating a Raid 0 or 1 array setup. The 936QSE chipset has the ability to be configured in Raid 0, 1, 3, 5, or 10 configuration. While with the 936SE, well, I was unable to confirm its features as of this writing. All chipsets have an integrated hardware Raid controller that is controlled via a software utility. This is a great advantage over software-based controllers, which are generally shown to be slower than that of hardware-based controllers. The Glyph ForteRaid is advertised as having the 936 chipset in it, but does not specify which version. Another interesting note, is that in researching different arrays in this price range, I came across the OWC (Other World Computing) Mercury Elite Pro which just happens to appear to be the exact same product as the Glyph ForteRaid. OWC is primarily geared towards Mac-based products but is configurable for PC’s as well. Their website specifications for this unit explicitly state that the 936QSE chipset is being used in this unit. It is for this reason that I think the Glyph array has the same internal parts as the OWC version. One item in this topic I am still unsure of is whether or not the internal backplane of the ForteRaid is a single PM (port-multiplier) that all four drives connect onto or if they are truely direct connections to the internal PCB board to be controlled by the chipset…and I am certainly not pulling mine apart to find out! For me, the last topic is really just the esthetics of the array itself, as it is not pretty compared to its competitors…to me anyways. Most manufacturers tend to build or use a more ‘traditional’ desktop array setup with four drives spaces mounted horizontally, stacked atop each other with individual drive trays. The Glyph unit mounts its drive vertically beside each other. However, you must remove a perforated front cover in order to access the drives. The Glyph unit does not include a locking front panel, unlike what was displayed on the OWC website. Each drive tray has a screw that holds/locks that drive into place. There is also a fan on the rear of the case that draws air in from the front across the drives to help cool them. It is for this reason the design of the case works well with the air being drawn in through the perforations on the front cover of the case, allowing air to circulate across all the drives. Most other manufacturers have a similar feature but I am not sure with the drives mounted horizontally, if the drives get better cooling. Another feature about the case I am not crazy about is that to access and remove the front panel, you must slide a plastic switch that is located on the bottom of the array unit towards the front. By sliding this switch, it allows you to slide the entire array unit forward from inside the outer housing. This is quite cumbersome should you need to replace a drive quickly. With the horizontally mounted drive unit arrays, you can just slide the drive tray out, replace the drive, and slide it back in, a much more convenient operation without removal of a front cover. On the Glyph and OWC, you need to slide the switch underneath, slide the array forward, remove the front panel, unscrew the drive tray, slide it out, replace the drive, slide it back in and reverse the process. This is really Tom-ay-toe vs. Tom-ah-toe in the grand scheme of things. Though I do actually like the drive tray in the horizontally mounted units better than the Glyph, but again, this is just personal taste on a cosmetic issue. I certainly hope to not have to replace the drives anytime too soon or at all for that matter. Right out of the box, the array comes configured in a Raid 0 mode to work with a Mac. It comes with an eSATA PCIe card in case your motherboard does not have an eSATA port. Mine happens to have 2 built-in to the backplane of the motherboard, as well as a front mounted port in the case. I am taking advantage of the ability to plug into an available 6Gbs port on the motherboard from this front eSATA jack. It also came with an assortment of cables including a USB, Firewire 400, Firewire 800, and an eSATA cable. What prompted this article however, were the directions for setting it up with a Windows PC. They are a bit all over the place and are not so easy to follow. After a few experimental tries, I was able to get it setup correctly and working properly. To note, there are a few considerations about this unit, not just the instructions. First, which is pretty major, is that the Glyph Management software utility is only manageable through the USB interface. This is actually stated in the user manual but is not easily found. 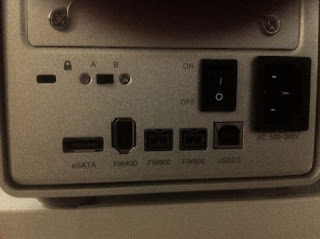 It also states that communication between the array and the management software does occur using Firewire or eSATA (using only an onboard motherboard eSATA port), however you cannot configure the array using anything but the USB connection. Later, after I had the array all setup, I tested each cable to see exactly what was being communicated. It turned out that they would only display ‘My Computer’ in their dialog window when attached, no actually drive information. Another related issue, more a configuration step, is that once the array is configured for Raid 5 mode, you must perform the formatting of the array via the connectivity you want to use in your final setup configuration. What I mean is that once the Raid option is configured, you need to disconnect the array from USB and re-connect it via the solution you want to use and format it while attached with that connection. In my case, I wanted to run the array via eSATA, which meant that I would need to configure the array in Raid 5 using the USB interface, then disconnect the array from the USB (properly through the Windows OS) and then re-connect the array using the provided eSATA cable, and then format the array. I also found that I did not need to power down during this operation. I did however need to reboot for the drive to be recognized via the eSATA cable afterwards. Once my array was successfully formatted in Raid 5 mode, I connected the array via each of the provided connections, which included USB, Firewire 400, and eSATA. It was successfully recognized on each connection showing the correct drive space and letter. Though this was not what had originally happened. Interestingly enough, originally, when I configured and formatted the array, all by way of USB connection, the array was NOT recognized using the eSATA connection. To confirm what I was seeing, I had copied some files over to the array via the USB connection, but when the array was connected by way of eSATA, the files were not viewable. Right, so now that I have you confused, just follow the configuration steps below. It may just save you the time I spent figuring out how to do this. 1) Install the Glyph Manager utility software from the provided CD or you can download it from the Glyph website. This software allows you to configure the drive array in one of Raid 0, 1, 3, 5, 10 through the software utility. 2) Next, using the USB cable, connect the Glyph drive array to your PC. This is the only way for the Glyph Manager software utility to communicate with the array; Firewire and eSATA are not supported for configuration of the drive array as noted earlier. 3) With the array connected via USB to the computer, turn on the array and power up your PC if it isn’t already running. 4) Next, you will need to initialize the array within Windows. Use the Glyph document ‘Windows Formatting Instructions’ available on their website. The key will be to only initialize and not format until later. 8) DO NOT format the drive yet as you need to configure the Raid type first. 1) Now, with the array connected via USB, start the Glyph Raid Manager utility. You should see the array with its drive listed and it should show the raid config that is currently setup on it. 2) Using the Glyph Manual as your guide, click the ‘Change Drive Configuration’ button. 3) Select ‘Raid 5’ if that is your desired configuration. I chose the 4-drive version instead of 3 and a hot spare. This is also where I am lead to believe that the chipset is the 936QSE as it shows a Raid 3 option, which didn’t appear to be part of the 936DS chipset in my research. 4) Click through and accept all the setup changes. You most likely will get a ‘quick-removal – Bad’ error at the end. This is just for firewire connections as confirmed in the Glyph instructions. Once completed, it should display the raid type you chose, and the health of each drive. 5) If you reached this step, then great! Now you need to format it. 1) First, choose to dis-connect the array from the USB port via Windows OS recommended best practices and either power down your PC or reboot it. 2) Remember to remove the USB cable from the drive array also. 3) Next, plug one end of an external eSATA cable into the array and the other end into an available eSATA jack on your PC; This cable has very different terminated ends than on an internal eSATA cable. 4) Power up your PC. 5) Once your PC is up and running, run Glyph Manager and you will notice the Raid configuration software does not display the setup any longer. This is because it can only do so via a USB connection, which was discussed earlier. 6) Next, go back to your ‘Windows Formatting Instructions’ document and follow the instructions for formatting your drive. 7) Again, click ‘Start’, right click ‘Computer’, choose ‘Manage’, click ‘Disk Management’ from the menu on the left of the pop up window, find the Array listed, and right click on it and choose ‘Format’. 8) You will want to choose the entire volume (as it is a Raid 5 now), which will yield roughly 2.7-3.0 Terabytes. 10) Windows OS does its thing and then you are now finished! 11) Lastly, always remember to re-start your PC after major configurations. Your disk array should now be listed in the Disk Management window with the label you gave it and should show 2.7-3.0 Terabytes available. You are now set to start putting your data on it. Should you feel unsure as to its setup, you can always unplug the array from the eSATA cable and plug it back in to your PC using the USB cable (make sure only one cable is plugged into the array at one time!) to see that the array is still configured in the Raid mode you chose. You can also monitor the drive arrays health from the USB connection, something that is not offered on other manufacturer’s drive arrays that I am aware of. As of this writing, AVID ProTools 9 is noted as not being able to support recording or playback from a drive that is larger than 2TB. I was able to successfully playback a video project with 10 tracks for a period of time, but it did eventually crash. I continue to test this ability and search for updates regarding a fix for this issue. Here is a quick and easy way to get audio to your headphones from your DAW/NLE with your audio interface...particularly if you only have 1/4" outs and don't have a direct headphone amp in your interface. You know those little portable SD card recorders? Zoom, Marantz, Tascam, Edirol...etc, well here is another use for them when you need to monitor but don't have a headphone amp or mixer to split out to. (1) portable recorder with 1/4" inputs and headphone output. First, connect your 1/4" cable up to your DAW/NLE interface's 1/4" left and right or 1 and 2 or which ever you use for stereo outputs. Second, connect the other end of the 1/4" cable up to inputs on the portable recorder. In my case, it is a Zoom H4 with 1/4"/XLR combo inputs. Next, once the interfaces are connected, put your portable recorder into record mode. Units will differ in how this is done, but the Zoom H4 has a 'arm' indication with a flashing red light. In this mode, you can monitor the input the recorder and hence, monitor your DAW/NLE output in a pinch! See, no need to carry around an additional headphone amp if you use a portable recorder such as the Zoom H4. You will need to make minor adjustments in the portable recorder to get it just right, but at least you will hear something. Well, it has been a little while since I have upgraded my digital audio workstation, so the time had come for this necessary evil...with a bit of fun to it for this geek. Anyways, over the years, I have mostly built my systems from scratch. Now you can probably tell I am a PC user from that last statement, which has been the case for many years; for ease of upgrading, configuring, and smaller investment/bigger bang for the buck reasons. This time however, I have gone a slightly different route. That is to say going through a vendor/builder instead of building it myself. For me, research is a big part of it. Though it seemed to take me just as much time to research the vendors as the components alone to build it myself. This time I have decided to go with a custom built system from a dedicated system builder, in this case Reyniers Audio based in Florida. These builders are dedicated to building digital audio based systems only, though you can do video and graphics on them, they are specifically tuned for audio applications. During my initial research, I realized that between the time I would have spent choosing the components, checking compatibility, purchasing the parts, installing them myself, never mind needing to return any that might be defective and having to wait for a replacement while all the other parts sit around running out of their replacement time, not to mention warranty pains...UGH! Well, it just started making more sense to go with a dedicated system builder/vendor with the knowledge, expertise, and compatibility concerns already realized, not to mention a warranty that was almost better than the manufacturer's. From here, my obsessive self took over of course, by having to compare all the vendors and their components, pricing, and warranty to find the best price/performance/guarantee that I could afford. Of course, with Mac's you don't really have to do this, but that's no fun! Well, there are some good vendors to choose from out there and I think I would have done alright with any of the five I narrowed it down to, but the vendor who won my business was heavily due to pre-sales assistance. All my emails were answered promptly and thoughtfully, including a phone call, and plenty of re-assurance was given that what I was considering would match well with what I wanted to accomplish and then some. Now, I will say that many vendors were responsive to my concerns and needs, but their pricing tended to be quite a bit higher for similar components and slightly less warranties in some cases. Some even charged for the initial consult!... (not listed here). In the end, I felt good about my purchase, the vendor, and having my needs met. Again, I think other vendors out there are good, maybe even great too, but Reyniers Audio met my challenges, needs, and my budget. As this is my blog and not a review for an industry rag, I will mention that I was considering workstations from PCAudio Labs, ADKPro Audio, Stonewave, VisionDAW, Audeum, Rain, Sweetwater, Puget, Titanus...even DigitalStorm and CyberPowerPC (both of which offer pretty incredible builds for the money, just not tweaked for audio). The first five mentioned were my top choices. Also, I had decided not to go with a Mac for now, as I have enough invested on the PC side, as well as I wouldn't want anything less than a tower which would have been another $500+, plus shifting programs over, and that just wasn't making sense for me. Also, the processor on the Mac at that level, in tests, didn't show any advantage unless moving to a dual proc system, which got pricey…Now onto the beast itself! I chose to go with the Virtuoso i7 system in a desktop configuration instead of a rackmount case. This was mainly due to the fact that I didn't intend to travel with it, the rackmount is slightly louder, and it will probably be in the control room with me. The case, as you can see, is very well equipped inside. It has the 2 pull out bay for HD’s. There are even rubber grommet spacers for the HD’s to mount in the bay’s. 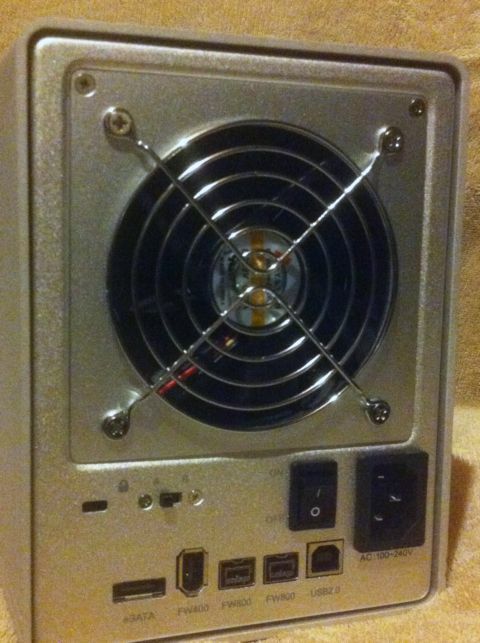 A separate area for the psu, which helps the noise but I tend to wonder if the psu would better help the cooling on the interior if it were in the same compartment. The front door has a nice breakaway feature where it opens past the usual 180 degrees. Also note the extra spaces for 120mm fans in the front of the case and the external connectors for esata, usb, and sound. As you can see I haven’t installed my BR yet. Impressive case. So, here are the specs…the processor is the Core i7 950 at 3.06Ghz spec with a Noctua U12P and a Gigabyte X58 chipset UD3 mobo, 6 Gigs of Corsair XMS3 Ram, a 850 Watt Nexus PS, and a simple Gigabyte 8400GS video card, as I still haven't decided which card to move to...ah decisions. And of course, Windows 7 64bit on a 1TB system drive as I run Sony Vegas Pro 10, Sound Forge 10, and the new Pro Tools 9 is coming. Also, I did not order a project drive as I already had one as well as a Pioneer Blue Ray burner. All that, AND I don't have to tweak a thing! As you can see, the installation was very clean and tidy and they even pre-ran SATA cabling for my project drive and Blue Ray. In some shots you can see where mini cable ties were used as well. The rest of the cable is run behind the motherboard in a shallow open area designed for it. I installed all of my software and hardware that included an Maudio Delta66 (soon to come out) and a Motu PCIe424 for a 2408. Once completed, I ran the Acronis Backup software to make an image of the system in case of disaster. The system already comes with an image of the completed machine, but another image should be made to include the programs installed, that way you don't have to go as far back as the initial OS installation. One note I will make, is that at the time of receiving the system from the vendor, the Acronis software disk did not make it into the package when shipped. A quick simple email to Wouter fixed this and it was received promptly. Also, they are very open to questions, concerns, and feedback. Ok. It was all complete…hardware, software, licensing…up and running after a few hours of installations. For its first project, I was able to use it to finish up the last installments of the 'Hit and Run History' web series on WGBH.org. Man did those app's open quick! I was able to use my new Izotope RX2 noise reduction software as well and the performance was incredible. My final mixes were done in no time flat and that gave me a chance to try some rendering tests. I used a demo reel that ran about 4 minutes long that was on my old system still. Then I swapped out the project drive into the new DAW and ran the same thing again. The results were astounding. Render time on the old PC (P4 2.8G with 2.5 G Ram on an Asus P4 mobo) using the same software (still installed) and configs was a little over 10 minutes to render. On the new system, with the same software and configs, it took only 2.5 minutes! And this is a video render folks! Going from an mpeg base to mp4 for the web. Sound files just render out in a cough! Well, it has been a quick 12 week 10 episode adventure! It absolutely flew by with some much happening at the same time. We even taught a class called 'How to Create a Web Series' for the Learning Annex in NYC. This class was taught live but is available as a download directly from them. For this last episode 'The Auction', we had a great time flying down to Philly to catch the Stack's auction which held one of the rarest medals ever produced in the United States, the copper version of the 'Columbia' medal. It was really cool being able to hold it (in its case!) and see it up close and feel the weight of it. Sure we have seen it up close before and in person but this seemed a little different. These medals were made to commemmorate the voyage of the ship Columbia, pass out during the travels and give to dignitaries. What you didn't see were some of the other cool stuff that we were able to catch a close up of as well that included a bar of gold and old padlock from a sunken ship! Once again this was very guerilla style production with a small, inconspicuous camera and some wireless lavs. The lighting in some spots was horrible, the camera was focusing on wrong spots, and of course the audio had its issues...but we managed. So it's on to the next phase for 'Hit and Run History' but I will continue to post about the projects they do and possibly post a few "how to's"from these webisodes. Well here comes the fourth installment of the Hit and Run History web series for WGBH of Boston at their website www.wgbh.org/history. Taking place in Boston as well as the gorgeous Fort Hill in Orleans, MA and is tackling the subject matter of Joseph Barrell, one of the backers of the expedition. This one happened to be one of the easiest mixes yet, aside from some rather large amounts of wind noise at Fort Hill. Having not been not been in attendance at these locations the production tracks were actually not too bad to deal with. And who doesn't love a little Van Halen-esq type music! Well, enjoy the latest and stay tuned for the rest! Well there is a new episode up at wgbh.org/history from Hit and Run History telling the background of John Ledyard and how he came to be a player in the story of the ship Columbia. This was an important person in the story as he himself was a major traveler. As you will notice the production is relatively the same as the others having been shot on a Canon HF100 in HD at 24p for the most part. Budgetary constraints have not yielded a nice shotgun mic just yet, but they make do with a couple wireless lav's now and then. Be sure to check out this latest episode. Cape Cod Times Features Hit and Run History! Today, the Cape Cod Times had a nice feature on the 'Hit and Run History' WGBH web series in their Art and Entertainment section. The web series which can be found at www.wgbh.org/history will be running for the next 10 weeks and featuring 10 different webisodes on the key players (financiers and such) involved in the Columbia Expedition. Garrett Audio provides sound services to the motion picture and music industries as well as digital media content. We are based on Cape Cod in Massachussetts and travel worldwide.